Well now that I'm in make-up school I'm going to buy some new palettes...I'm thinking MAC, Coastal Scents and Bobbi Brown so I'll let you know whatever I decide to purchase. 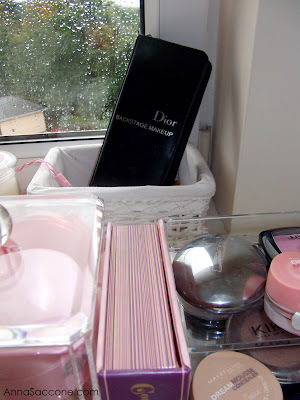 I also need to get some sort of a vase for my brushes because my collection is growing all the time and my Dior case is too small to hold all of them! All of the clear plastic storage items here were bought in Home Store & More for under €15 (I think the larger unit was €14 and the smaller was €10). My mirror was €5 and the white basket with my brush set in it is from Dunnes Stores. Do you have any make-up storage ideas/tips? I love what you've done with the room,very warm,girly but still classy! I agree with you,giving,donating and at times throwing is great to refresh your wardrobe,see what you really need and wear and then you use everything more!I always look forward to your posts. A lot of people use vases with bean bag fill to hold their brushes, so that they are stabilize and don't lean towards the edges. I can't find bean bag fill in a small quantity so I use uncooked rice in an opaque black vase from a craft store!!! I like to think that the uncooked rice wont absorb moisture... but we will see. I know the great feeling when you give or throw out your make up stuff. I don't like having too much make up 'cause it makes me think that I would never use every product. 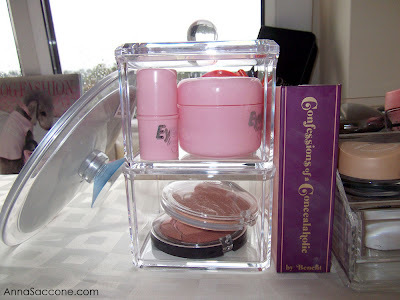 Not sure if you have a Guineys store in your area, but I recently bought a few storage containers for my make up and stuff, I know the shop is a tip but if you have a good root round you will find some great pieces, your room looks great by the way. I just tossed out a bunch of old eyeshadow that was well over 4 years old (ick!). Most people don't pay attention to expiration dates, but I'm starting to be more fanatical about it. You collection looks really nice--you really love Rimmel, huh? Also, your site is running much more smoothly now! I'm glad I don't have to be afraid of clicking anymore! 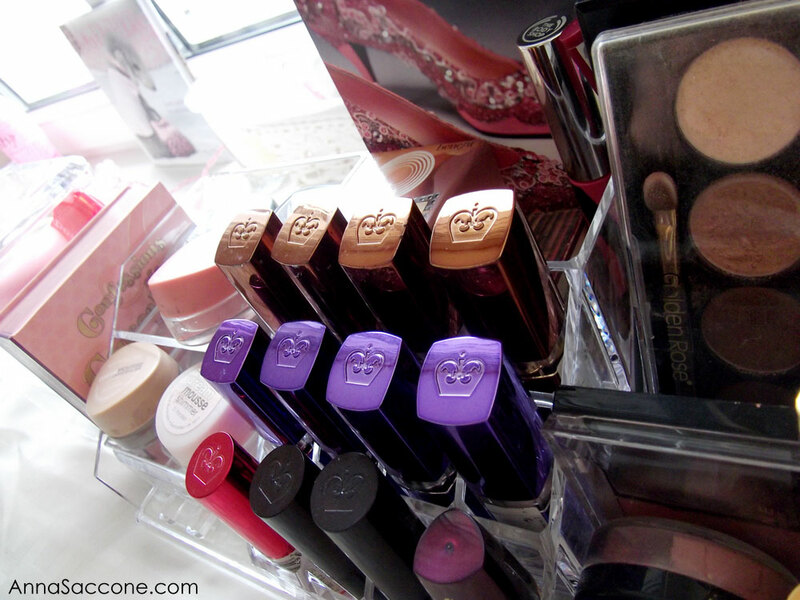 Love the way you keep your makeup stuff, it looks really organized and clean! I bought the 88 warm palette from Coastal Scents last year and would highly recommend it. I think you would love it too, since you typically do pretty neutral looks. @Autumnfound Thanks girl! Yes, a spring cleaning now and then is always good! @Shopperita I'm the exact same as you! I feel bad if I don't use all the make-up I own on a regular basis. @Anonymous2/Sarah Thank you! That's a great idea, I never would have thought of looking there. @Courtney Yeah, Rimmel lipsticks are my favourite :) Happy to hear that about the site! @Catanya Thank you so much, Catanya! @Vikki Thanks for the recommendation, I definitely will check that out! Just wondering also did you get the Sleek pallete here in Ireland coz Im dying to get my hands on them! Such great ideas, love the prices too...thanks, Anna, it looks wonderful! Could you do a makeup tutorial on the classic red lips please? I know bolder lips is a big trend for the upcoming fall/winter season, but I would like to see a "toned-done" version for everyday. Thanks in advance and greetings from Greece! i love your make up collection & storage :) xox. I just wanted to tell you that your blog and your videos are really inspiring and I love your style! Hope you'll tell us soon some more tips and tricks you're learning at the make up school!! Continua così, non ascoltare chi ti critica ingiustamente e pensa sempre positivo!